No. 235: Is that Kevin Hart doing a box jump? This is issue no. 235. The last issue had a 43.51% open rate with 4.76% of you reading up on the shift from athletes to models for shoe companies. Did a colleague forward this letter to you? Thank them and subscribe here. 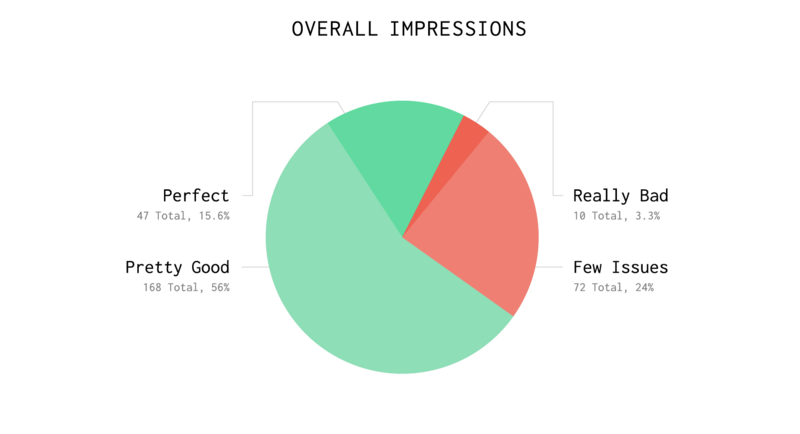 Pittsburgh's Cotton Bureau employs data-viz to explain how they're using feedback from 300+ testers to influence future productions of their upcoming product line for Blank. Click-through the graph for information on their upcoming Kickstarter launch as they set out to make the perfect tee for everyone. eCommerce feature: Perhaps what Amazon is trying to do as it rapidly expands into new businesses—especially business areas where it might not have forged partnerships with well-known brands—is to give the impression to customers that there are tons of options to choose from, when in fact, they’re really just choosing between different Amazon brands. “Consumers pay a premium for a brand, that’s why they’re not store-generic,” DiMassimo suggested. Media: YouTube is undergoing a transition that touches on more than where people view. The brand safety revolt this year prompted the company to hold creators, some with big followings, to higher standards. The full impact of that is yet to even play out. The move to the living room, however, could ultimately prove helpful by giving more prominence to professional content and de-emphasizing reliance on the "creator class." eCommerce: Private-equity firm Sycamore Partners in 2014 hired Newmine LLC to relaunch Coldwater Creek, a fashion brand that had closed that year but retained a following among middle-aged women. Clothes were available for sale online four months later after a “fast-paced, SWAT-team-like” effort, said Newmine Chief Executive Navjit Bhasin. Media: The best way to measure if that strategy is actually working is a metric called ARPU, or the average revenue [generated] per user. When Snap filed for an IPO earlier this year, it specifically mentioned ARPU as a key way to measure its revenue growth, and the company explained that it was primarily focused on adding new users in developed advertising markets to help bolster this number. Logistics: The patent also discusses the possibility of these mobile containers as a potential means to “forward-deploy inventory items.” A second car or container could carry items where “demand for such inventory items may be reasonably anticipated,” which would allow the company to shorten its delivery times. In this case, an order could be placed, with the item dispatched from the closest fulfillment center, whether it’s a physical warehouse or one that happens to be located on a rail line nearby. The order would be loaded onto a drone, which would then take off, deliver the package, and return, where it could get its battery charged again. Brand: The wave of fashion collaborations in recent cycles reflects a growing awareness that it is established rather than new luxury consumers that will drive future demand. Through collaborations, brands can provide existing consumers with the ‘newness’ that reignites engagement with established and familiar product ranges. Brands can also better cater to millennial and Gen-Z consumer preferences by co-opting creative aesthetics that suit a younger generation’s tastes, a strategy best exemplified by Rubinchinsky’s Burberry capsule. Data: The survey also found that 75% of millennials and GenZ are willing to share personal information in exchange for a personalized experience and despite their youth and reputation as "less brand loyal," the majority of GenZ are already participating in at least one loyalty program. 71% of millennials are also active in at least one program. Retail Real Estate: I had wandered into Saks hoping to learn how a venerable department store was dealing with the upheavals throttling the retail industry. As stores around the country reckon with Amazon.com, discount chains and changing consumer habits, they are turning to “experiential” offerings that entice people to enter their doors. eCommerce: As part of the move, GrubHub and Yelp also reportedly agreed to a five-year partnership that will integrate Yelpers’ reviews into GrubHub’s restaurant listings, meaning if your local diner comes out as staunchly anti-gay or wrongly accuses patrons of pooping themselves, you’ll probably know something’s afoot when you visit GrubHub.com now, too. In addition to the upfront money, Yelp will also get a cut of sales (a “partnership fee”) every time somebody places a GrubHub order through Yelp. eCommerce: But leveling the playing field also means widening the number of participants, and it doesn’t always mean increasing the supply. So that means more people having to leapfrog a bench in a dead sprint to try and grab a hold of the prize. It’s much more high stakes than trying to put shoes in an online cart, but not as strenuous as waiting in line, some would argue. eCommerce: Grailed was started in 2014 by Arun Gupta, now the CEO, out of a sense of frustration with the unfriendly way coveted men's fashion was being bought and resold online. (A grail is a hard-to-acquire item that tends to appreciate in value over time.) "What killed me on Styleforum was that it took three clicks to get to a photo, and then a minute to load it," Gupta, who previously founded a tech startup in San Francisco, recalled at the Grailed offices recently. "Why can't I have a full feed of photos? I was like, I can probably build that. So I did." Retail: For a portion of independent retailers, LuLaRoe is to economic opportunity as Goop is to wellness: It’s for ladies who already have it all. The ability to throw down $12,000 to start a LuLaRoe business and work 30 hours a week sometimes comes from a place of privilege, not desperation. Some mothers who are just looking for a hobby have husbands whose salaries are already high enough to support their families. eCommerce: NOT since the dotcom boom at the turn of the century have technology shares been on such a tear. On July 19th the S&P 500 index of information-technology stocks hit a record high, closing above its previous peak in March 2000 (see Buttonwood). Last Word: Do we want to be athletes anymore? According to Rorsted, there have been a few keys to Adidas’ success. Among these are new products designed specifically for women, such as the PureBoost X running shoe; better store displays; and importantly, the realization that the way to reach female customers isn’t through star athletes. Do we strive to be athletes anymore? The answer is an overwhelming no. With the growth of the athleisure market has come a desire to look the part without the commitment of an athlete's arduous lifestyle. Speaking of, the lifestyle sector of sporting brands has grown at the expense of technical performance products and we're seeing it manifest in new ways. Just today, I noted via Twitter that of the ten most popular searches on Reebok.com, Gigi Hadid outranked the first athlete by four positions. This search data was especially interesting given that one of Reebok's prized media properties (the CrossFit Games) concluded, yesterday, in spectacular fashion. The search for "CrossFit" ranked ninth on the list. Nike has done the least of any big company in regard to non traditional, non pro athletes. I think it has affected them as the trend towards a more genuine interaction with stars of social has taken off. Search for any athlete outside of Lebron, Ronaldo, or Jordan on Nike.com and you're more likely to find a photo of Kevin Hart than you would a photo of Ashton Eaton, the world's best athlete. On Adidas.com, you will see Pharrell Williams before you stumble on a photo of a sponsored athlete. Is this shift a result of American sports losing its luster on Madison Avenue? It's more likely that for once, consumers feel the lifestyle of an influencer or a celebrity is more aspirational than a basketball star's or soccer player's. And with athleisure and lifestyle "streetwear" being the go-to for many, dressing the part has never been more accessible.